When you’re in pain, the least little annoying thing can become HUGE! and cause you to throw your hands up in the air in a) disgust; b) annoyance in general; and c) futility. Since Spring is supposedly trying to get sprung, Arther has been working overtime on me. He even put me in the bed for a couple of days – not consecutively, thank God! Along with arthritis, I’ve been having a hellish time trying to hear and was actually too pain wracked to make it to a GP visit, I suffered through it and hoped the antihistamine and Flonase would work. In order to listen to TV programs, I had to put on headphones through the XBox controller in order to not blast everyone else out of the house. While I was battling this, Sniffles had a serious virus which took her voice. In one day we became the Deaf and Dumb Sisters. She mimed and wrote notes while I talked and read lips. Yes, there were moments of hilarity when we tried communicating. The guys just left us alone and do what we needed in order to converse. One thing I try to do as an adult is be informed with the news – local and national, sometimes world. However, during this most recent bout of illness, I simply couldn’t take any more news articles, programs, or reports. The national news should have been something to laugh at, but it only made me depressed. The local news was all about fatal car accidents, shootings, and council members taking pot-shots at each other and the mayor like grumpy kids when they don’t want to go down for naps. The world news was just plain screwed. It was beyond doom and gloom, and not something I wanted to witness, just for a moment, while trying to encourage my body to heal. In short, I needed an escape from the world around me as well as my body. So, what did I do? 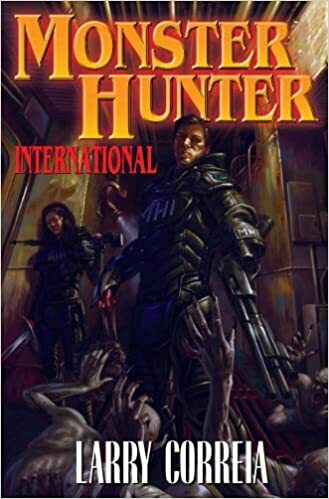 I began reading Monster Hunter International, by Larry Correia. Larry Correia has stepped into the realm of Favorite Authors for me along with Patricia Briggs, Janet Evanovitch, Illona Andrews, Jean Anderson, and a handful of others. (No, none of these authors will ever take the place of Charles Dickens. Yeah, I’m a geek like that.) When it comes time to escape this world and frolic in someone else’s, Correia’s creations are fast becoming some of my favorite ones to read about. Monster Hunter International is a good chase and run through monster hunting with the intrepid members of MHI. You can’t beat them. In this first novel, we meet the hunters for the first time as well as Newbie, Owen Z. Pitt. Affectionately known as “Z” by his teammates, we see how Owen gets his start in monster hunting and it involves him discovering his chubby, middle management, egotistical boss is really a werewolf. Owen actually survives the attack, without being bitten, and sends his boss through the window of his building. From there Owen falls in love at first sight; learns to fight monsters; and save the world. Oh, and he gets the girl! This was the perfect novel I needed to read while healing and dealing with pain. It gave me wonderful hours of escape and solidified me as a Correia fan. Ten out of five stars! This entry was posted in 2017, arthritis, authors, book reviews, books, Uncategorized and tagged Larry Correia, MHI, MHN, Monster Hunter, Owen Z. Pitt, shoes, technology. Bookmark the permalink.